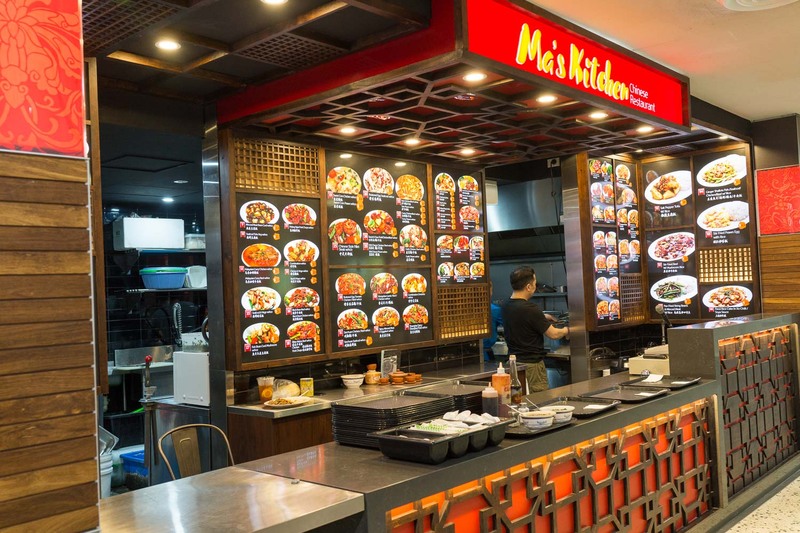 Ma's Kitchen in Chinatown's Sussex Centre Food Court is the joint we hit when we get the itch for some really good and shiny Chinese stir fry. We reckon it's the Malaysian/Indo influence in the cooking that gives it the extra oomph. These guys are old pros - quick and businesslike - the guy at the counter even smiles sometimes. The servings are generous and value plus. We intended to eat our way through every dish on the menu that struck our fancy - but at eight visits we are still only halfway there, so this post is like a halftime break. We've written up Ma's Kitchen before before, but we're doing it again because some of the grand old dames of the food courts have retired lately, we celebrating these joints while we can. Peking style pork chop with rice - $11. Deep fried pork chops in a sweet totato-ey vinegary sauce, like sweet-and-sour with a touch of (we guess) belecan, or some such base note flavour. A big serve - we took half home and had it for dinner with a pile of veggies on the side to make up for the fat and sugar. 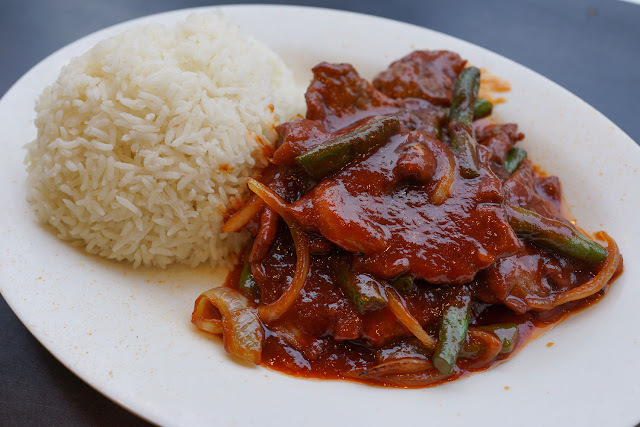 Chinese style fillet steak with rice 12.30. Steak medallions which taste comfortingly steaky. Those steaky flavours poke through sweet tomato-y sauce, similar to the Peking style pork chop dish above. 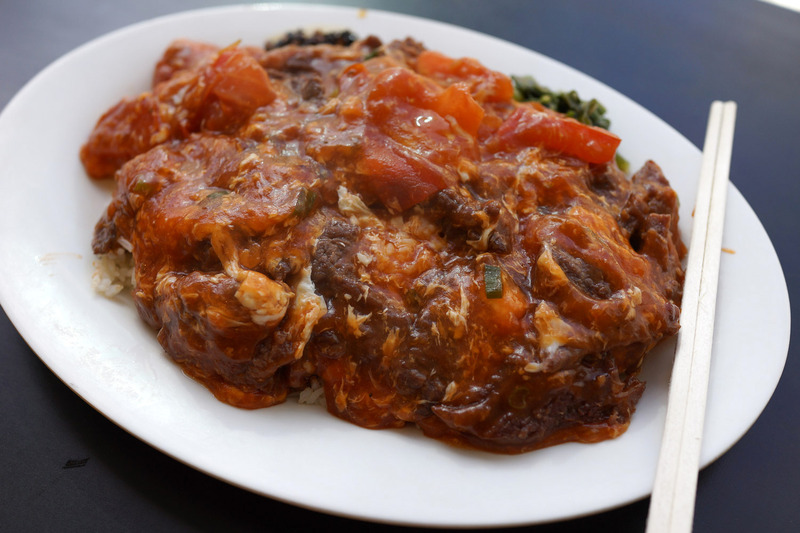 Buttered egg tomato beef (or chicken) with rice $10.80. A heart warming, homely sweet goo of tomato and egg. 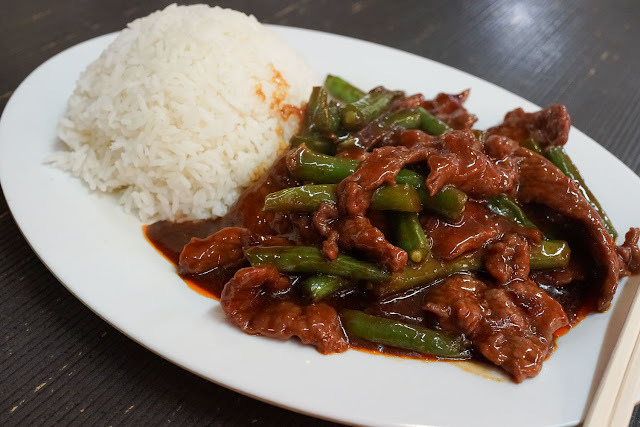 The beef slices are super tender and punch through the sweet sauce, we guess the beef is tenderised with a little baking soda, it works a treat at home. 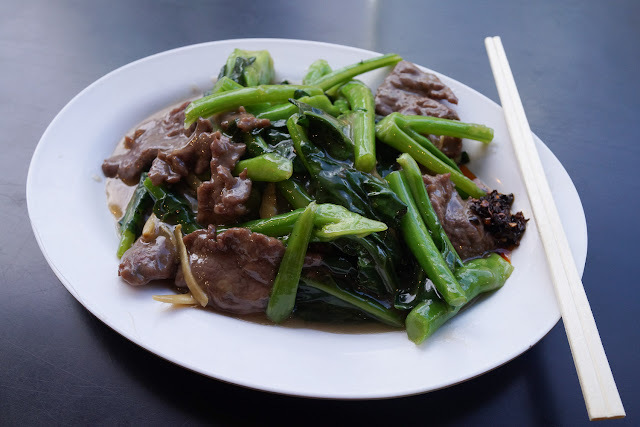 We reckon we'll be trying more of the beef dishes here, they do it so well. 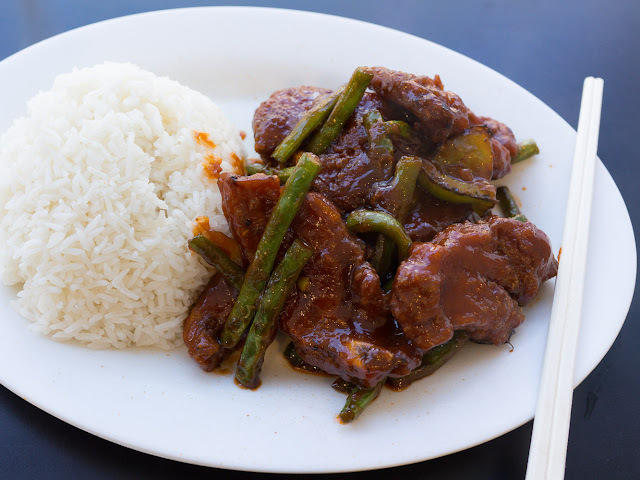 Spicy belican beef (or chicken) with rice $10.80. Less sugar but plenty of oil and funky shrimp paste. 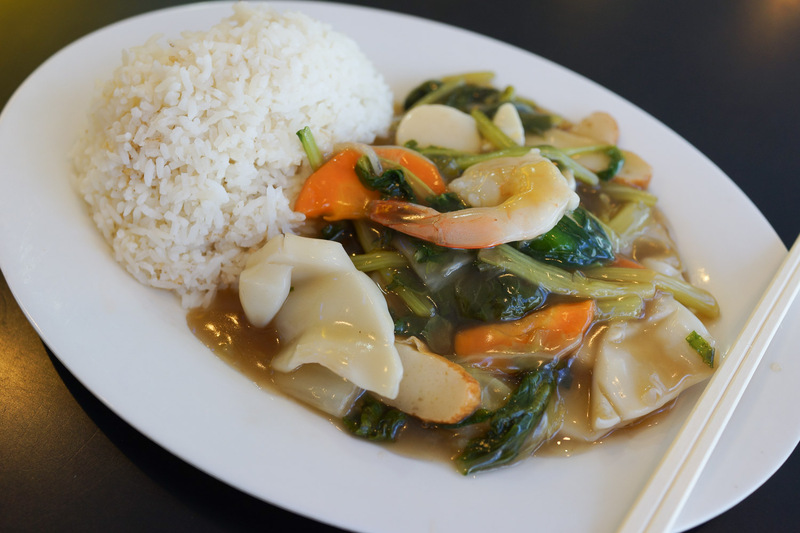 Seafood vegies and rice $11.30. Prawn squid fishball fish cake and chinese greens in a plain gloopy sauce. 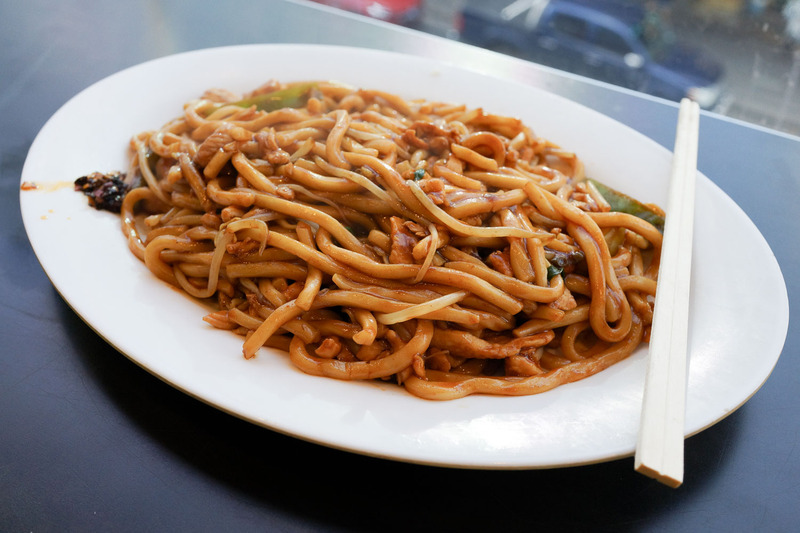 Shredded duck mushroom noodle $11.80. Hokkein noodles in a sweet dark sauce with plenty of duck for your buck. 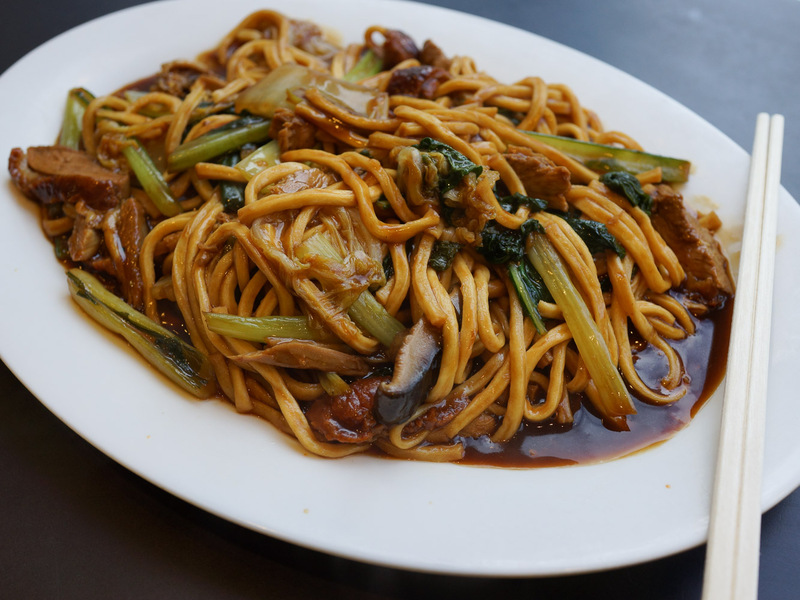 Roast duck and noodles are just made for each other... Chicken and noodles are acquaintances, pork and noodles are great pals, while duck and noodles rent rooms by the hour. Ma's Kitchen also does version with vermicelli, which from memory is less sweet and equally yum. Chinese brocolli in ginger and oyster sauce $11.30. Gotta try what we don't usually... It's plain though fresh with a nice ginger kick poking through, you can see the shards of fresh young ginger. 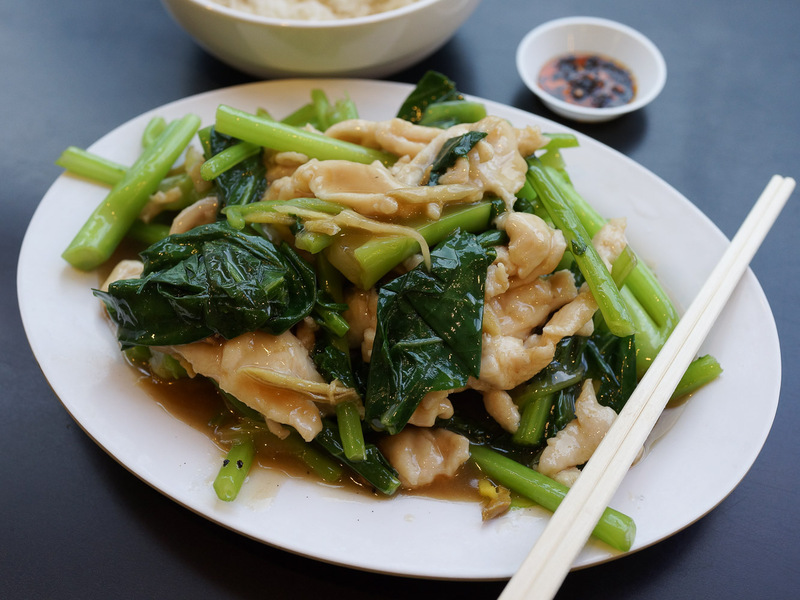 The oyster sauce makes for a solid flavour base under the ginger. Add some chili oil to lift the flavour to a new level. There's a lot of veggies and not so much sugar and oil. 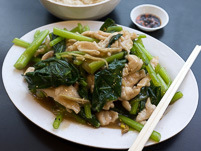 This is foodcourt health food, a surprise new favourite dish. Mr Shawn loved the chicken'n'ginger dish so much he tried the meat version. Between these two dishes we travelled to Hong Kong, London, Paris and Phuket. Much of that time he was dreaming of Ma's Kitchen ballsy stir fry. Except in Paris. Anyhoo, the beef version is great but wethinks the chicken and ginger are the better match of flavours. You may think otherwise. Is anybody actually reading at this point? Well we're still eating, this time it's Mee goreng with chicken (or prawn) $10.80. Mee goreng has become Mr Shawn's favourite noodle dish for sussing out a chef's style, and street cred. Other folks go nuts on char kway teow, but with char kway teow you're chasing the same experience every time. The beauty of mee goreng is that every chef does it differently, very differently. This one has a litbit sweet sauce with a mild to medium chili hit coating the noodles just nicely, with streaks of chook, egg and veg. It's pretty good. Our favourite mee goreng so far was in one of those 24 Halal Indian joints in Penang, the balls of the dish was a well-balanced mix of spices, rather than sauces. Ma's Kitchen is in the Chinatown's splendorous Sussex Centre Food Court, head up the escalator to Shop F5 at 401 Sussex Street. What a delight to read and look at. You both do a great job with these reviews. I too like this place. Sydney can be so exciting and good value if you look around. Dunno about noodles for breakfast. I've tried. I really have. When in Bolehland (M'sia), I don't mind half boiled eggs or Hakka fish ball soup. Roti-Cani, no worries lah. But noodles at breakfast? Suspect some of the rellies think I'm a bit Angmoh. Thanks Trevor! Noodles for breakfast is wonderful when done right, especially flat rice noodles, stir fried with egg and a little pork and chilli, the morning after the night before.